Join our Community Forums! Like us on Facebook! Follow us on Twitter! Follow us on Google Plus! Subscribe on Youtube! Follow us on Tumblr! The Red Baron returns to the Skies! #RedBaron is the tag we're using on social networks. When you share, use this with your posts! Get involved in the Red Baron community! Dogfighting: Aerial combat at its best. Take to the skies in fighter aircraft like the Sopwith Camel and Fokker Triplane. Persistent Multiplayer Game World: Jump in any time, day or night, for a challenging mission with or against your friends. There will be both historical and MOBA-style maps. Single Player: Enlist for the full tour in campaign play with more than 30 missions played back to back from 1915 to 1918. Single player will be offline and DRM-free. Easy to Learn: Red Baron will have a simple learning curve, allowing you to jump in and play within minutes and feel the rush of aerial combat. Relive the rich history of the Great War! We will faithfully recreate history and transport The Great War onto your PC, much like a time machine. Red Baron will simulate the flight characteristics of the aircraft of the day, and our ace AI system will recreate the behaviors and personalities of famous historic aces. 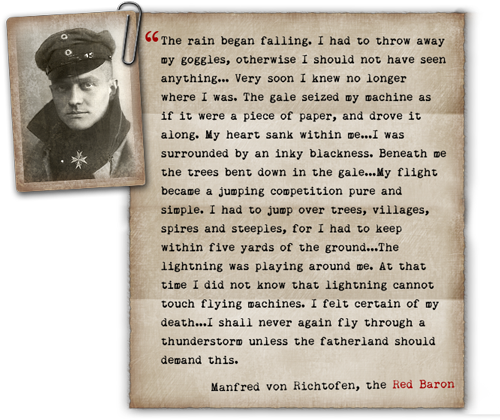 For example, Manfred von Richthofen, the Red Baron himself, said “I am a hunter. My brother Lothar is a butcher.” By this he meant he stalked his prey and avoided unnecessary risk, whereas his brother threw all caution to the wind. In our game, you will not see the Red Baron recklessly diving into battle unless he holds an advantage. How can I support Red Baron?